Expanding on the core sets that have made Bob Books such a success, Spring 2008 brings us an all-new Bob Books set! 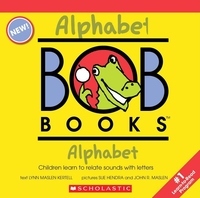 This Alphabet Set includes 12 books of 12 pages each, and brings Bob Books' proven teaching tools to children who aren't quite ready to read Set 1 yet. The letters of the alphabet are introduced in a fun, easy-to-understand way as only Bob Books can!